I'm a sucker for a good cupcake, and admittedly, a bit of the macabre. To that end, getting the perfect finishing touch on these particular cupcakes meant scouring the dollar store for cheap plastic dolls that could be easily dismembered for the desired effect. I felt a little weird at first, but told myself that they fulfilled their ultimate destiny by topping these mini cakes as art. Once you've tracked those down, the hard part is over, because making these cupcakes is a snap. I was pressed for time so I just used a boxed devil's food cake, whipped up a simple chocolate ganche (recipe below), and the dirt, well, that's nothing more than some crushed up chocolate wafer cookies. 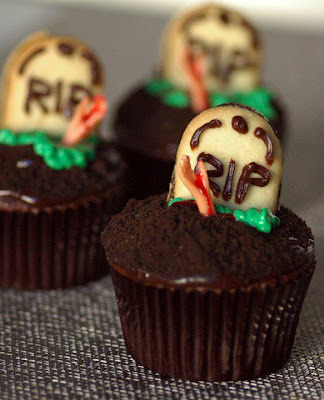 Speaking of cookies, Pepperidge Farms Milanos make perfect gravestones with a bit of chocolate frosting in a tube to decorate them. Some green frosting for grass, and a final smattering of red gel frosting doubles nicely as blood. In a small bowl, add the chocolate, corn syrup and pour over the scalded cream. Whisk until smooth. If for any reason you have a few lumps of chocolate that haven't melted completely, place the bowl in the micorwave in 10 second intervals, whisking until smooth. There was a time when I was convinced that Indian food was too hard to make at home. Or perhaps, too exotic. I wasn't exposed to it as a kid and it just seemed like the type of cuisine you go out for. 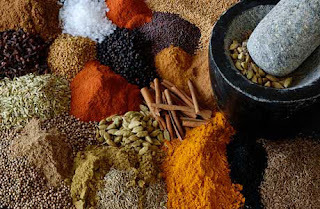 I love Indian food, but I always assumed that attempting it meant spending the day running around to several specialty markets collecting all kinds of esoteric ingredients. Just the thought is a major buzz kill for me. Fortunately, it's not true, but it took Nigella Lawson to show me the light. A few years ago I was buzzing around the kitchen, her show on in the background. I was only half paying attention when she mentioned Mughlai Chicken. That was all it took to land me squarely in the palm of her hand. I found myself leaning against the counter, suddenly paying complete attention. As I watched her sear, sauté and coo her way through the recipe, I realized that most of the ingredients were already in my spice drawer and the rest could easily be found at my local market. I also loved how uncomplicated and effortless it seemed, in spite of my previous thoughts to the contrary. 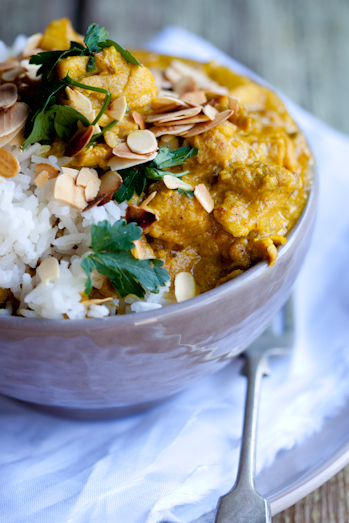 The following recipes have become my go-to when I'm craving Indian food. They come together quickly and the flavors work beautifully together, each one complimenting the other. 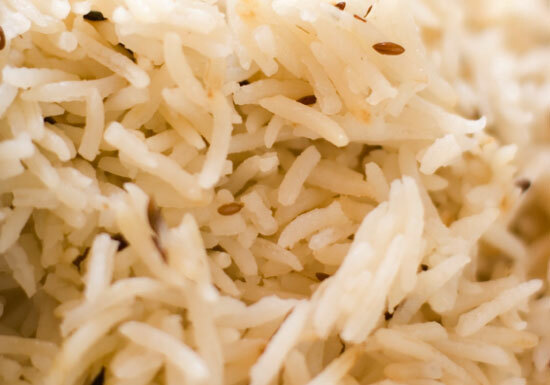 The fragrant Rice Pilaf is the perfect perch for the Mughlai Chicken in all it's golden, saucy glory. And the cool Pomegranate Raita is a nice counterbalance to the mild warmth of the dish. To finish it off, I always grab some naan bread from Trader Joe's to serve with. Now see! That wasn't hard at all. 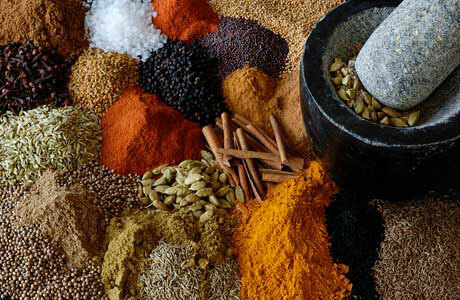 Put the ginger, garlic, cumin, coriander, and red pepper flakes into a food processor and blend to a paste. Add the ground almonds and water and then blend again, set aside. 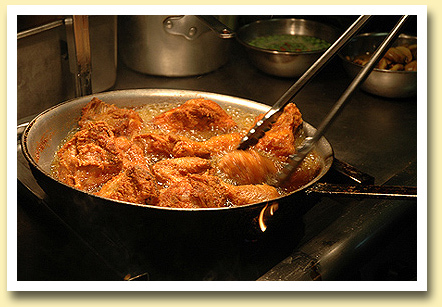 Heat the oil in a large pan and add the chicken pieces - in batches so they fry rather than stew - and cook them just long enough to seal on both sides, then remove to a dish. Add the spices and turn them in the oil. Add the onions and cook them until softened and lightly browned, but keep the heat gentle and stir frequently, to avoid sticking. Pour in the blended paste, and cook everything until it begins to color. Add the yogurt, half a cup at a time stirring it in to make a sauce, then stir in the stock, cream, and sultanas. To serve, scatter with cilantro and toasted flaked almonds. Saute the onion in the oil, in a deep saucepan with the cloves, cardamom pods, cinnamon stick, cumin seeds and salt, until the onion is slightly browned and soft. Keep the heat medium to low and stir frequently; this should take about 10 minutes. Combine all of the ingredients in a bowl, reserving some pomegranate seeds for garnish. 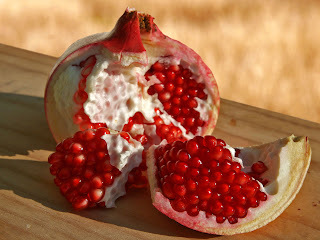 Stir everything together, and serve in a bowl scattering the reserved pomegranate seeds over as a garnish. There's something immensely gratifying about taking something ordinary, like the taco, and elevating it to a level that's impressive enough for company. Carne asada tacos are everywhere and there's some great ones out there, but filet mignon tacos are something special. It may seem a tad bit extravagant, and of course you could substitute chopped chicken, or ground beef, or even shrimp, but if you're looking for a twist that will knock your socks off, this is the recipe. If you're going to make an amazing taco, an amazing tortilla is essential. My favorite brand is LaTortilla Factory. They're hand made and a delicious mixture of corn and flour so the texture is soft and pliable, so they don't split like regular corn tortillas. You can find them at Whole Foods, but I've seen them popping up more and more in regular grocery stores as well. They're definitely worth tracking down. In a blender purée the chiles and water until smooth. 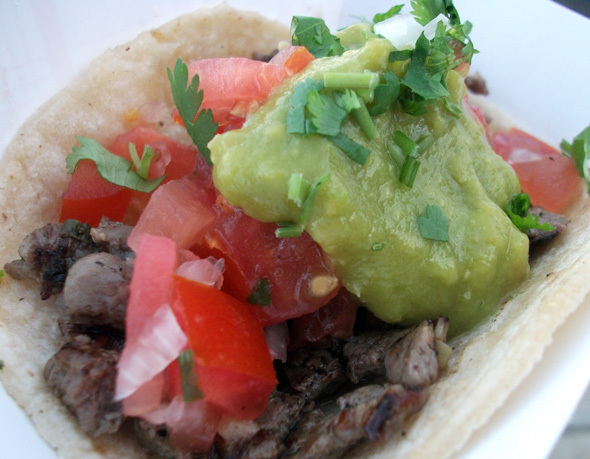 To make the taco meat, combine the filet mignon, salt, pepper, coriander and cumin in a bowl and mix well to coat the beef. Heat the oil in a large sauté pan over medium high heat. When hot, spread the seasoned beef in the pan in a single layer and do not move. This will sear one side of the meat. After 1 minute, toss the meat to brown and cook the other sides. Mix in 1 tablespoon or more of the chipotle purée and toss to coat. Remove from the heat and place in a bowl. Add another tablespoon of vegetable oil to the pan and sauté the onion and jalapeño until softened and slightly caramelized, about 2 to 3 minutes. Add the onion mixture to the meat and mix until combined. Set aside. 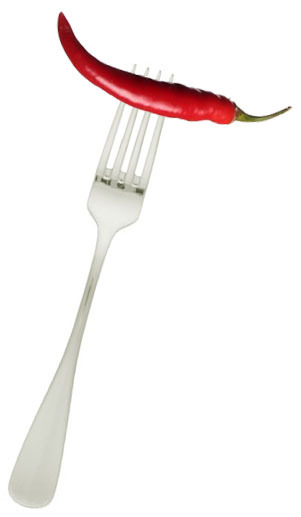 To prepare the pink chile sauce, combine the sour cream, mayonnaise, chipotle purée and lime juice and whisk until smooth. Season with salt and pepper and refrigerate until ready to use. To prepare the mango radish salsa, combine the mango, radishes, onion, avocado, lime juice, cilantro, oil and salt and pepper. To make the taco slaw, mix the cabbage, scallions and cilantro leaves in a bowl. Set aside. To serve, spoon the meat into warm tortillas, sprinkle with cheese, top with the mango salsa and cabbage slaw. Serve with your favorite hot sauce. 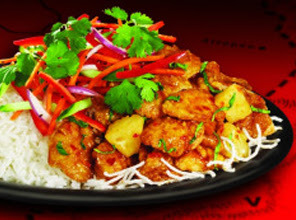 Okay, so this may not be the exact recipe for Caramel Chicken, made famous by The Slanted Door, a popular Vietnamese restaurant in San Francisco. Theirs is actually made in a clay pot and takes much longer to prepare. Ain't nobody got time for that! It’s been well reported that this dish is a favorite of Mick Jagger, who makes a point of ordering it when he’s in the city by the bay. This version is quick, easy, and delicious, and can be whipped up in just a few minutes on the stove top. No clay pot required. In a small bowl, whisk together the brown sugar, water, fish sauce, vinegar, sherry, tamari, ginger, garlic and chilies. Season chicken generously with pepper. In a large sauté pan, heat the oil until shimmery and almost smoking; add the chicken and sear on all sides until golden brown, about 5 minutes total. Adjust the heat as necessary. Push the chicken to the sides of the pan forming a well. Pour the sauce in the middle of the well and reduce until thick and syrupy, about 2 to 3 minutes. Stir to coat the chicken and finish cooking through, about 5 minutes. Stir in the scallions. To serve, mound rice on a platter and pour the chicken over. Shower with peanuts and cilantro. Note: Tamari is dark aged soy sauce. I have a serious weakness for fried food. Any fried food. I’d rather have a french fry than chocolate any day. Although, a french fry dipped in a chocolate shake is really the best of both worlds. I salivated recently watching Paula Deen submerge macaroni and cheese in a vat of hot oil. Clearly, this was before her recent thirty pound weight loss. Fried butter absolutely intrigues me, though I’ve never actually tried it. And as far as I’m concerned, the only reason to go to a state or county fair is the deep fried food booths. So, naturally, I’m always on a quest for deep fried perfection. The best oil, the optimum temperature, the perfect crust. Should I use a deep fryer machine, or a cast iron skillet like my Grandma did? And... How do I fry something without having to power wash the kitchen afterward? I admit, that’s my least favorite part, but when I do manage to reach fried-anything-nirvana, it’s so worth it! I have, I believe, through a lot of experimentation, reached fried chicken nirvana and successfully answered the questions above. I know I’ve posted about fried chicken before, but I feel this redux is well worth the repetition. I’ve learned a lot since then. I fried 5 batches of chicken in one week to arrive at my destination. By the end of the week I was begging people to take it away. 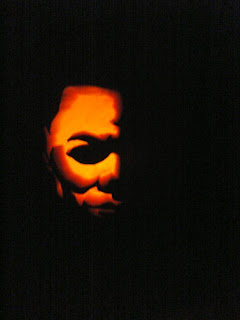 “Hey, Mr. Mailman...!" I confess that frying at home isn't always easy and there were certainly a few snafus along the way. I sustained one nasty finger burn, got popped with a lot of hot oil and ruined a good shirt that I knew better than to fry in. It all started to pay off though as each batch of chicken got better, and when I figured out that I could fry outside on the previously unused burner on the side of my gas grill! No power washing necessary when the mess could be relegated to the outdoors. The problem it seems with fried chicken, is that you very often end up with a nice golden crust on the outside and pink, underdone meat on the inside. Nobody should be eating or serving medium rare chicken and normally, I’d just throw it in the oven on a sheet pan to finish cooking it through. But then one day while surfing the internet for inspiration, I stumbled upon a technique of cooking the chicken first and then frying it up! It was brilliant! How did I not know about this? You actually poach the chicken very gently in the milk that you brine it in. The result is perfectly flavored, succulently sweet meat, and no more medium rare chicken, ever! The crust is an amalgamation of a few different recipes, but I stumbled on one from Padma Lakshmi that incorporated crushed Saltine crackers and Rice Krispies for added texture and crunch. Now, as weird as that may sound, it’s truly inspired and the results speak for themselves. Trust me on this one. Because the chicken is already cooked, and can be done well in advance (a huge bonus in my book!) all that’s required is a quick dredge and an even quicker fry to achieve that beautiful crispy crust! 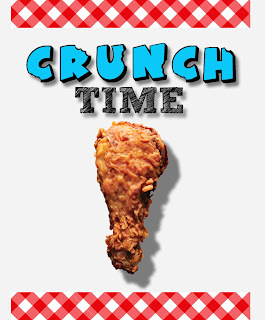 And when I say quick, I mean about two minutes quick! I’ve included a helpful essentials chart below to guide you through the process. Oh, and the pan matters! 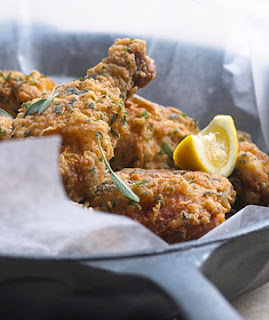 An old fashioned cast iron skillet just like Grandma's is indispensable for conducting heat evenly and helping you reach your own fried chicken nirvana. In a large bowl, whisk together the milk, hot sauce, lemon juice, garlic, thyme, salt and pepper. Add the chicken to the milk mixture, cover, and refrigerate for 8 to 10 hours. In a shallow dish, combine the flour, smashed cereal, Saltines, salt, lemon pepper, garlic powder, onion powder, cayenne and paprika. Beat the eggs in a shallow bowl. Using tongs, transfer chicken into a large pot with a tight-fitting lid, then pour in the milk. Bring to a boil, then reduce heat to medium-low, allowing the chicken to simmer gently, until just cooked through, about 20 minutes. Remove the chicken from the milk and place on a rack set over a sheet pan to cool. Allow the chicken pieces to sit until warm, about 15 minutes. 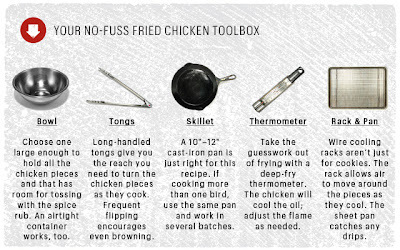 In a deep, heavy skillet, preferably a cast iron one, heat an inch and a half of oil along with the garlic and herbs until it reaches 360˚F on a deep-fry thermometer. When the garlic turns golden brown, skim it out, along with the herbs; reserve. 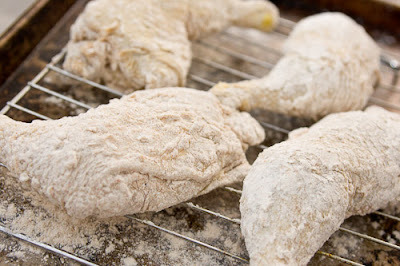 Dredge each piece of chicken first in the flour mixture, then in the beaten egg, then in the flour mixture again, rolling to coat each time. Gently, carefully place each piece of chicken into the hot oil, allowing the crust to crisp and turn golden brown, about 2 minutes per side. Don’t crowd the pan, cook just enough pieces at a time so that each is bathed in oil and the oil stays at 360˚F. Drain the browned chicken on a rack set over a sheet pan, allowing air to circulate around and keep it crispy. Serve with lemon wedges spritzed over and scatter the reserved herbs and garlic over the chicken.